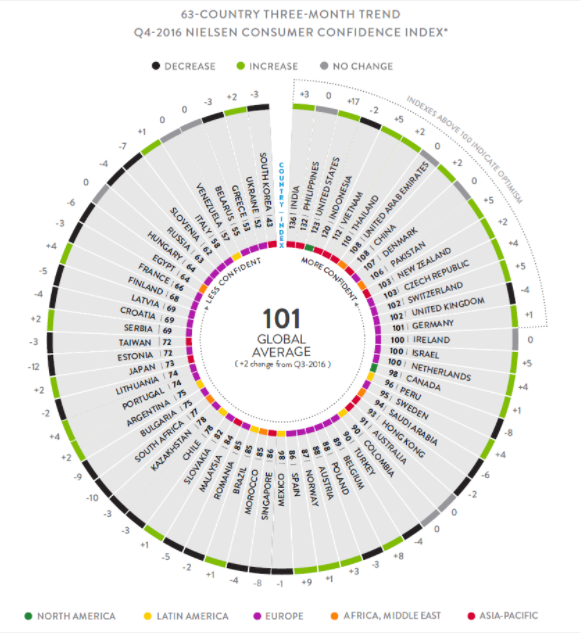 Consumer confidence index in Pakistan jumped five point from the prior quarter to reach 106 in Q4/2016, according to Nielsen’s global survey of consumer confidence for 63 countries released recently. "Consumer confidence in the Africa/Middle East region declined in the fourth quarter, falling four points to 83, the lowest level in more than three years. Confidence was highest in United Arab Emirates, which held steady from the third quarter at 108. Pakistan was the only country where consumer confidence moved in a positive direction, rising five points from the third quarter to 106, the highest score for the country since it was added to the survey in 2008." The share of Pakistani respondents worried about job security dropped to 21%. 51% of Pakistanis said they are optimistic about better job opportunities in the next 12 months, according to the survey. “The findings of the consumer confidence reflect a favorable atmosphere in Pakistan. The set of factors that influence the confidence levels of Pakistani consumers goes beyond economics and business, and is reflective of improved security conditions, increased energy availability and low inflation rates,” reported the survey. Pakistani banks have boosted lending to businesses and consumers. Large-scale manufacturing sector borrowed Rs. 225 billion in 2016, up from Rs 119 billion in 2015. Consumer loans have jumped from Rs. 29 billion in 2015 to Rs. 70 billion in 2016. Auto financing soared 32% to Rs 30.7 billion in 2016, according to the State Bank of Pakistan as reported by Daily Times. Pakistani consumers and businesses are feeling increasingly confident with improved overall security, rising foreign and domestic investments and better employment prospects. They are earning, borrowing and spending more to further stimulate the economy thereby creating a virtuous cycle. Low oil prices and relatively subdued inflation are also helping. It's now up to Pakistan's political, economic and military leadership to maintain this growth momentum. This further corroborates the impression I have of Pakistan after my recent visit. Things are finally looking up there; the mood is definitely upbeat. Thanks for sharing the good news. I am afraid the cynics --- best described by Oscar Wilde as those who know the price of everything, but the value of nothing --- will not be impressed. Ahsan: "Thanks for sharing the good news. I am afraid the cynics --- best described by Oscar Wilde as those who know the price of everything, but the value of nothing --- will not be impressed. " It also backs up the findings of the recent World Happiness report that saw Pakistan rise 12 places from 92 to 80 on happiness index. India is #1 in this report or am I misreading it? Anon: "India is #1 in this report or am I misreading it?" India's consumer confidence is 136, the highest among 63 countries surveyed. It increased 2 points last quarter. However, the increase of 17 in the US consumer confidence last quarter in the best in the world. Pakistan's increase of 5 points is the 2nd best in the world. So the absolute value and change are both very important for businesses and economists. Growth accelerated in FY2016, benefitting from major economic reforms and improved security. in construction to 13.8% underpinned 6.8% expansion in industry. which was 1.4 percentage points higher than in the previous year. environment, security issues, and bouts of macroeconomic instability. private sector imported markedly higher volumes of goods other than oil. KARACHI: The country’s middle class is experiencing a rapid growth, which is evident from the rising demand for consumer durables, education and health, according to the State Bank of Pakistan (SBP). Preliminary data on crops indicates that agriculture growth will rebound in FY17. million tons on the back of timely and widespread rains. season also point to a better performance of the crops subsector. FY17 came from food, steel, cement and pharmaceutical industries. historical mainstay of LSM growth. Enterprises (PSEs), and a decrease in banks’ profitability, act as potential drags. momentum (see Chapter 2 for details). percent to US$ 1.1 billion during H1-FY17, from US$ 978 million last year. percent, and rubber products 0.04 percent. in the agriculture and manufacturing sectors. (15 percent) and demand for loans (11 percent). (89), confidence increased by nine, six and four points, respectively. contrast, confidence in Australia declined two points to a score of 89.
include India (down seven points) and Thailand (down three points). Is Husain Haqqani Switching Loyalties Yet Again?